One of our great-nieces got married Friday night and of course it was an occasion for me to make another quilt. This particular great-niece has three younger sisters and six younger female cousins, so there will be plenty more to make in the future. And I have another niece getting married in October, so I’ve started working on a quilt for her. 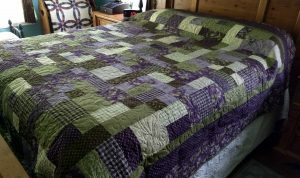 I love making special quilts along with all the t-shirt quilts and memory quilts that I make for customers. Here’s a photo of the quilt I gave our great-niece last night. I assume she is honeymooning right now, so odds are she won’t see this picture before she opens her gift. Of course, I will be happy to make a quilt for your special occasion as well. Contact me for more information.